I have been touching upon a similar theme in most of my writings over the past couple of weeks. We are at a point in the markets where some pretty strong medium-term term trends have developed against opposing longer-term trends (copper, USD, stocks to name a few). Are we going to see the longer-term trends reassert themselves or are these medium-term counter-term trends going to continue further to test some much deeper retracement levels in 2Q16? As markets often do, they are making figuring this out as complicated as possible. Crude is an instrument that clearly fits this bill as the commodity advanced more than 60% off the early February low before stalling out about 20 cents shy of the 200-day moving average late last month. The 200-day moving average has been a remarkable level of resistance over the past year or so as every counter-trend recovery attempt has failed right around that widely followed resistance. Was the failure last month the long-term downtrend reasserting itself or was the recent turndown from there just a minor pause before another squeeze higher? I can’t say. The fact is that crude found support exactly where it needed to earlier this week as it tested the lower parallel a pitchfork structure drawn from the late January low and has headed directly higher since. As such, this medium-term uptrend needs to be watched very closely next week. There is a pretty clear timing relationship towards the latter part of the week. A secondary low (against this week’s low) into this timeframe above the pitchfork parallel (currently around 36.50) would be pretty positive and open the door to another important push higher. A close over the 200-day moving average over the next few days would also be a pretty clear positive technical development and signal an important change in behavior. A failure on the other hand to hold above the support next week would argue that we have witnessed a secondary high against the 200-day moving average similar to how things played out in November. In this case look out below. 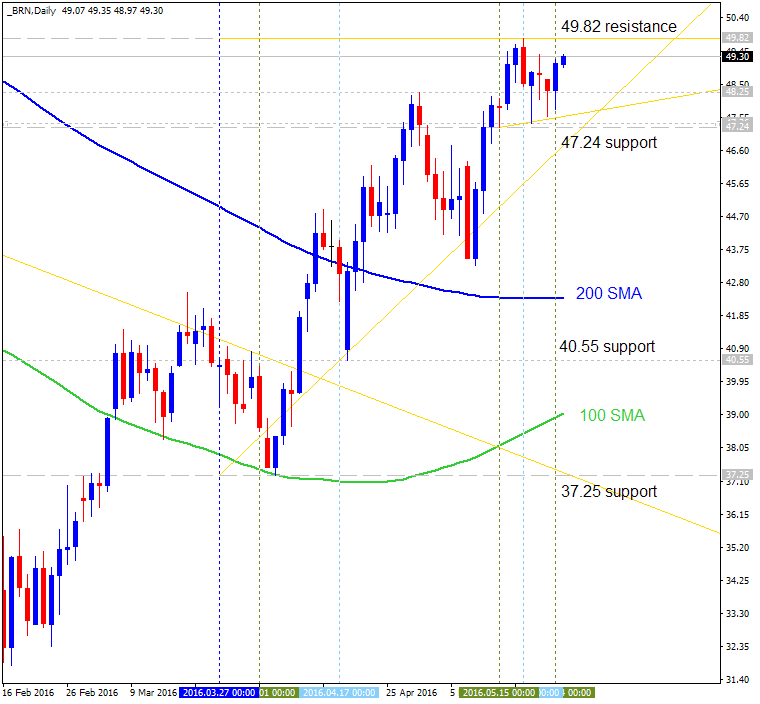 42.49 support level located below 200 SMA and above 100 SMA in the beginning of the ranging bearish area. RSI indicator is estimating the secondary ranging market condition. 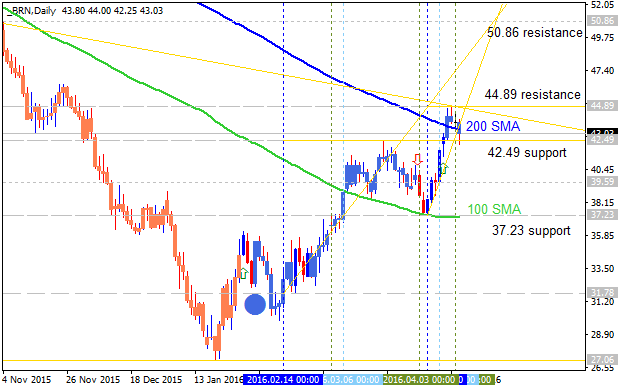 If the price will break 44.89 resistance level so the bullish trend will be started. 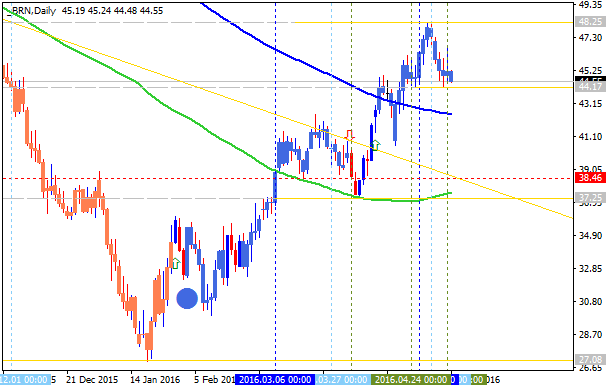 If price will break 42.49 support so the ranging bearish condition will be continuing. 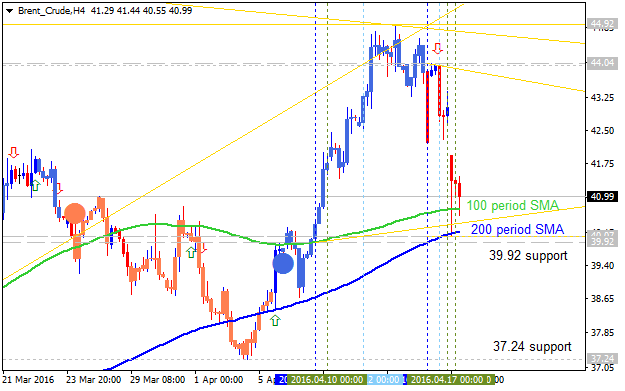 H4 price is on the secondary correction which was started today morning because of Doha talks fail: the price broke key support level to be stopped near 100 SMA/200 SMA reversal area and near above 39.92 support bearish reversal level. If this 39.92 level will be broken by the price to below on close bar so the intra-day bearish reversal will be started, otherwise - ranging bullish. If price will break 39.92 support so the intra-day bearish reversal will be started. The month of May doesn’t appear to be providing the bullish support for WTI Crude Oil that prior months have. At least, this hasn’t played out within the opening range or first week of trading in May. A strong US Dollar and weak global risk sentiment picture have caused concerns that the imbalance from supply, albeit contracting supply, and demand will remain unreasonably wide favoring lower price. As markets await non-farm payrolls on Friday, a few news developments provided a strong bid in WTI & Brent Oil (CFD: USOil & UKOil Respectively). First, news of a devastating wildfire in Alberta’s Oil Sands Area in Canada has led to the evacuation of the entire population just under 100k. Naturally, output has disrupted reducing supply by an estimated 1m bpd+ according to data published in Alberta’s Spring Oil Sands Quarterly. Additionally, developments in Libya and Iran have caught the attention of traders, and if nothing else, may provide enough fear to have short-sellers sit on the sideline until clarity reigns again. In Libya, escalating tensions may cause production output to fall by ~120k bpd if the National Oil Corporation (NOC), set up by the rival Eastern government, continues to block tankers. Lastly, Iran has noted that they are quickly reaching pre-sanction levels in production and market share already. Those fearful of a supply glut are seeing this as positive for a potential coordinated supply balance sanction by OPEC members. This morning, the following headline flashed: "IRAN READY FOR JOINT ACTION W/ OPEC AFTER PRE-SANCTION MARKET SHARE". The above chart is a medium-term price channel via Andrew’s Pitchfork tool with sliding parallels drawn with the slope of the median line off of key pivots. The lower handle is drawn off the February 11 low at 26.03. You’ll notice on the bottom-left of the chart; the sliding parallels have acted as key pivot support zones into Q2. Now that we have seen a break above the 200-DMA (currently near $40/bbl), our focus turns higher to the upper median line around $47.50. The Support Zone in focus after Thursday’s blast-off is the Wednesday low at $43.20. Wednesday's low is above the next level of support by ~$0.70 barrel at $42.48, which is the April 26 low that printed before pushing up to $46.75 to close the month. Below $42.48, there could be a quick drop to the 200-DMA, which would take a strong move lower down to ~$40/bbl. Given the significance of the Intermarket factors that have shifted since Oil broke above $40/ 200-DMA, only a move below there would change my bullish model. Given the macro environment, I’m staying bullish for now, and the April high is the next resistance level in focus at $46.75/bl. Beyond there, the Weekly R1 & R2 pivot at $46.77 & $49.35 respectively may soon be tested. In addition to the technical focus around Andrew’s Pitchfork, the sliding parallels, and the Intermarket relationship of the US Dollar, we should keep an eye on retail sentiment, which could be warning of more upside price action. The US Dollar and Crude Oil are both higher on the day along with SPX500. Much of what happened on Tuesday appears to be fueled by a risk-on rally as even the European Stoxx 600 rose by the most in six weeks at 2.2% on ~110% of its average monthly volume. On Wednesday, the EIA inventory data and Cushing Stock will be looked to confirm recent sentiment that there are large draws on current supplies that are aligning with disruptions of supply in Nigeria to further support price toward $50/bbl. Tomorrow’s EIA numbers are expected to come in at 2.25m bbl decline in crude stockpiles. Thankfully, the disruptions in Crude from the Canadian Wildfires don’t appear to be long-lasting as Canadian oil-sands facilities that workers evacuated last week due to wildfires are being allowed to prepare for the restart. 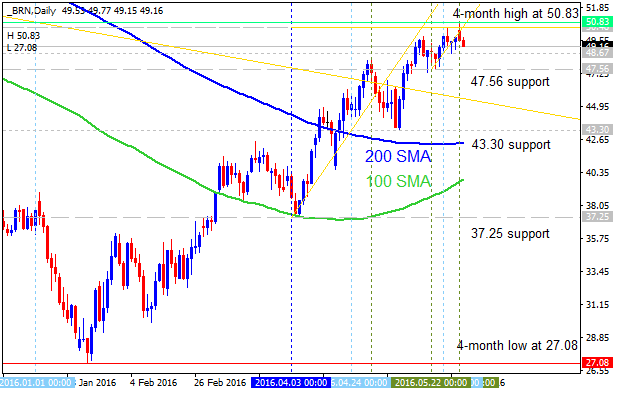 WTI Crude Oil Price Forecast: Heading For Four Straight Months of Gains! WTI Crude Oil Price came within a whisper of the 2016 high on Tuesday after hitting $50.10 in mid-morning trading ahead of July Contract expiration. Regardless of recent force, the CL1 June contract has seen a May price range of ~14% (43.03-50.21) that may be slowing down but does not appear done. After being the laughing stock of markets, Oil Bulls are looking at the longest run of gains in five years as they look to add another month to the streak of consecutive gains. While little is expected of the OPEC meeting this week, with some calling it a non-event, there is plenty to be on the watch for this week including the European Central Bank as well as the May Non-Farm Payroll release on Friday morning. Additionally, escalations in Libya continue to hold Oil trader’s attention. However, larger risk-sentiment as seen via the SPX500 so far has continued to favor the view that the stock of supply as seen in the weekly API & EIA inventory data that is pushed back one day this week due to US Holiday’s on Monday will continue to show a draw due to increased demand. 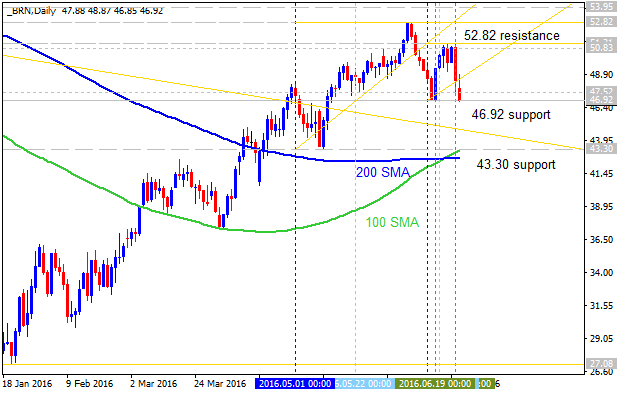 Crude Oil Daily: bullish trend to 6-month high at 53.95 as a target. 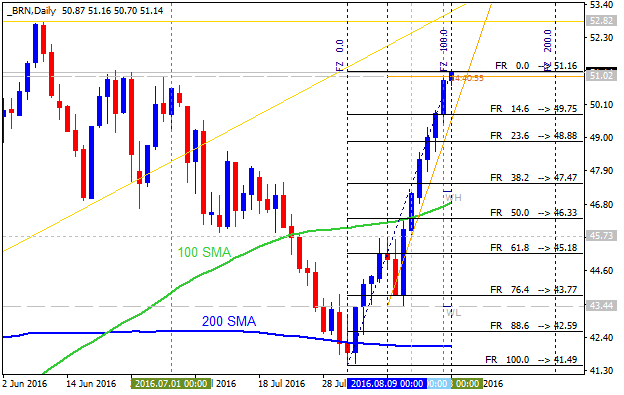 The price is located above 100 SMA/200 SMA reversal area for the primary bullish market condition: price is breaking 51.51 resistance level to above for 6-month high at 53.95 as a nearest bullish target to re-enter. 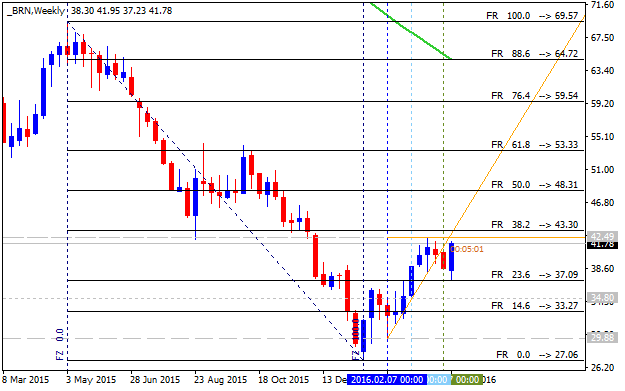 If the price breaks 53.95 level to above so the bullish trend will be continuing with 55.54 possible target for breakout. If the price breaks 44.60 support level to below so the reversal of the price movement to the ranging bearish condition will be started. If not so the price will be moved within the channel for ranging bullish. At a time when confidence was reemerging in the oil market as demand was picking up and a potential balance from oversupply in the first half of 2016, the Brexit vote likely came at the worst possible time. While desiring to avoid a melodramatic statement, producers began accelerating production with the assumption demand was picking back up aggressively and that the dollar was under control. However, with the recent break above 12,000 in the FXCM Dow Jones US dollar index and the breakdown in equities like the SPX 500 we could see a drop in risk sentiment that brings WTI Crude Oil (CFD: US Oil) lower as well. There are three things that stand out on the Daily US Oil chart. First, the resistance around $50 from the October high. Second, the lower high into the Brexit vote that was met with a much stronger US dollar. Lastly, the pressure now being put on the 55-day moving average that has been a clear directional bias indicator for crude. 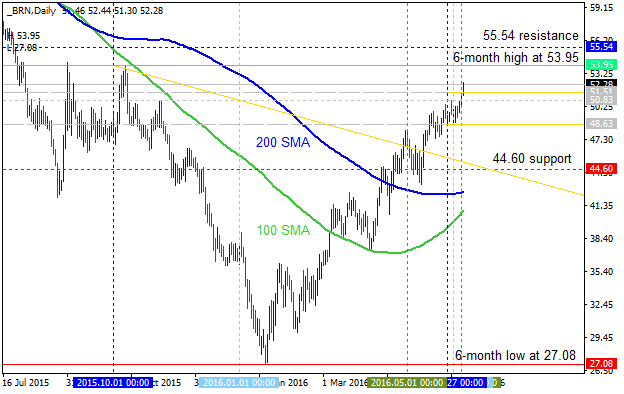 At the risk of oversimplification, if the US dollar begins to strengthen further, and WTI Crude Oil (CFD: US Oil) falls back below the 55-Day Moving Average (currently at $46.59 per barrel), we could likely see a retest of the March corrective zone. This zone occurred when US Dollar showed strength again that eventually faded. This zone sits at $41.85/$35.81 per barrel. A break below this zone would favor retest below $30 a barrel. We appear to be seeing a new wave of supply coming onto the market, and if demand cannot keep up (which the storage on Oil tankers argues it cannot), we could move lower. To explain how much lower, let’s move on to the charts. 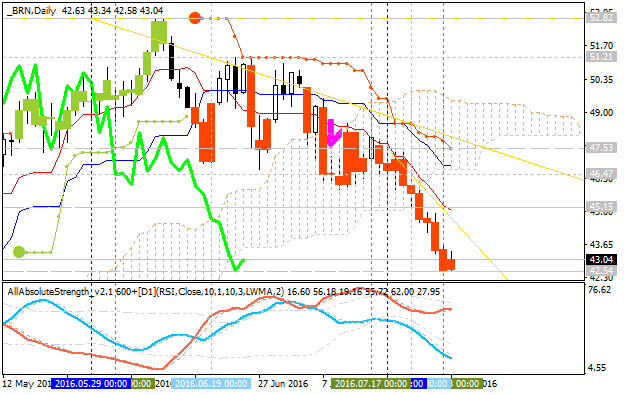 Ichimoku Cloud is a trend following indicator that allows you to see the “big-picture trend” on the chart. If price (shown via candles), and the momentum line (bright green on my chart) are below the cloud, we are in a bearish environment. Buying against the momentum and trend is not advised because a downtrend tends to gather steam much like a snowball rolling down a mountain. Significant support aligns at the 61.8% Fibonacci Retracement zone of the February-June zone, which is also the late-March low ~$35.81/bbl. While fighting a trend is not encouraged, that is a level to see if buyers begin to show up due to bargain prices. If the US Dollar weakness continues, it seems like this trend could just be getting started. For more definitive levels, let’s go to the charts. After failing at the topchannel in June, the price quickly dropped down to a pre-identified zone provided by the median line and the Fibonacci Retracement levels in focus between $41.85-$35.22/bbl. Key support that would deflate the confidence of the 22%+ August trend would be a break below the higher-low of $41.27/bbl from August 11.